Now you can easily apply lotion to your back and elsewhere while massaging your muscles - all without the need to twist and turn into a human pretzel. 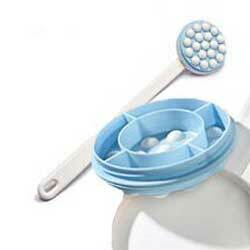 Just fill Roll-A-Lotion Massager and Lotion Applicator Duo with your favorite moisturizer, oil or foaming bath gel. The 19 rolling balls soothe and invigorate as they massage in the liquid evenly. The extra long removable handle makes it easy to reach your back - or any other hard-to-reach area. You can slide the handle off the applicator to massage your arms or legs without getting your hands greasy.